Cathedrals have traditionally laid the departed to rest within their walls. In keeping with that tradition, we established a Columbarium in 1989 in St. Mary’s Chapel which is open to the public during normal business hours. A Columbarium is a permanent structure with niches or compartments designed to hold the urns containing the ashes of loved ones. The entrance to St. Mary’s Chapel is on the south side of the church under the Porte Cochere. 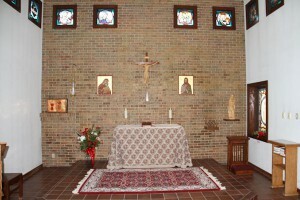 The Chapel is platted into two sections—North and South. When standing in the Chapel and facing the door, the North section is to the left of the door and the South section is to the right of the door. Our Columbarium allows our members and their families the opportunity to have their final resting place within the walls of the church that has been a central part of their lives. This sacred site is a serene place where loved ones can visit, pray, and meditate. The Columbarium eliminates the pressures of choosing a burial site, casket, vault, and monument. The costs of cremation and a niche in the Columbarium are significantly less than the costs of a casket, burial site, and marker. Plans are complete for expanding the Columbarium to a new outdoor garden that is to be built in the area between the Bell Tower, St. Mary’s Chapel, and the Porte Cochere. Additional niches will be available once construction is complete. Click the link below to view a plat indicating the location of inurnments in the Columbarium. 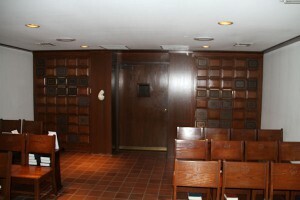 Since St. Mary's Chapel is sacred space, visitors are asked to respect the dignity and sacredness of the Columbarium.